This idea for this telescope came while I was on Ft. Walton Beach (traveling on business) straining to see a Nova V1494 Aql naked eye. Right there, I decided I needed something--a table saw! And what better excuse than "to make a telescope with, of course!" I bought the wood from a friend who runs a saw mill and builds beautiful mesquite furniture (send me an email, and I'll send you his phone number). I spent a week epoxying the cracks--mesquite just cracks; there's nothing you can do to stop it--and then began construction (after a trip to Woodcraft to buy a Jet table saw). 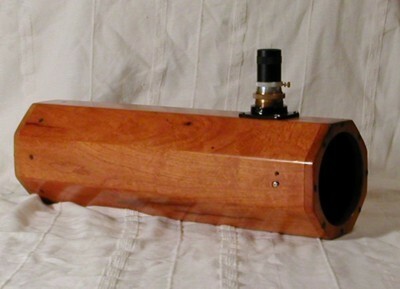 The tube is an octogon, 21" long with a 6" outer diameter and ½" thick. I started by cutting eight 3"x24" boards out of my mesquite stock and then, without changing the table saw's fence, cut about 42 3"x6" pieces off pine (1x10 stock that was just laying around). I set the table saw blade to 22 ½° and bevelled 8 pieces of the pine. They did not fit together well. I adjusted the blace angle and tried again on eight more pieces. Just as I thought I was going to run out of pine, I got one that fit perfectly. Without touching anything, I ran the mesquite through, bevelling each edge to exactly 22 ½°. 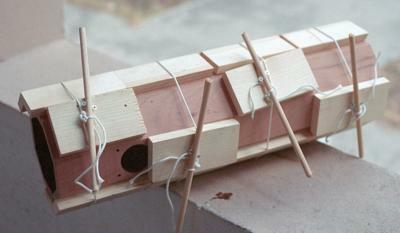 Next, I made a jig that to assemble 2 pieces together and started gluing. Four days later, I made a jig that assembled 2 sets of 2 peices giving the two halves of the tube. Two days after that I glued the tube together using the test pieces of pine, some extra pine blocks, rope and sticks to pull everything into place and hold it very tightly until it dried. I probably broke many woodworking laws, but it worked well. The vertices are mitered so closely that it is hard to see the seams. 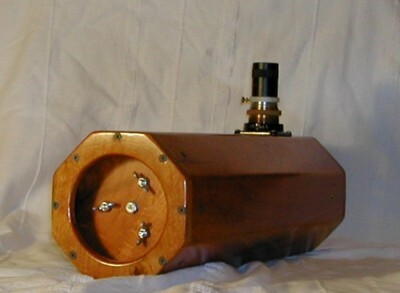 The mirror cell is a peice of oak, cut the same size as the mirror, with springs and bolts and wing-nuts for collimation. I used some straight brackets and RTV to attach the mirror to the cell. Once the cutting and gluing was finished it was time to start sanding. I sanded the tube to 600 grit. (yep, it gets better at 400 and even better at 600) and then set it out in the sun for a few hours. Mesquite turns redder in sunlight. Next, I put two coats of polyurethane on it. The tube is unstained; mesquite gets really pretty when sanded down to a mirror finish--no staining is necessary. The primary mirror is a 4.25" f/4 that I purchased via Astromart. 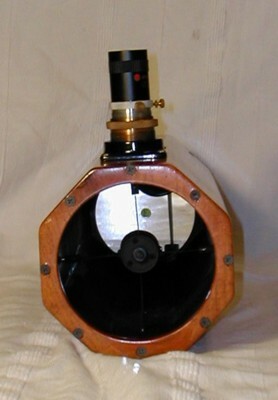 The 1.25" double helical focuser was made by Dave Rubenhagen at DAR Astro Machining and is available through O'Neil Photo & Optical. The spider and secondary is from Protostar. I originally made a spider (table saw, drill press, and hacksaw), but I didn't build it accurately enough and could not get the telescope to collimate, so I bought the Protostar spider. I use this telescope with a 19mm Celestron Axiom eyepiece with gives about 22 power in magnification and an incredibly wide field. The scope collimates fairly easily to decent performance, but is certainly not a "precision instrument". Not that you'd notice anyway, since you are holding it in your lap, trying not to breathe and watching stars bounce around all over the place! Still, it's fun to drag out a lawn chair and just cruise the sky.